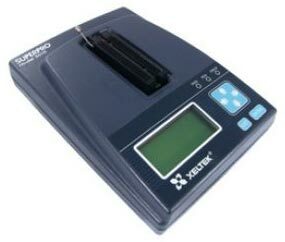 We are a prominent Exporter and Supplier of SUPERPRO Programmer (601S). An ultra high speed economy universal programmer, the SUPERPRO Programmer (601S) supports 223 IC manufacturer and 32216 + devices. Support 223 IC manufacturer, 32216 + devices. Under stand-alone mode the programmer is controlled via the keypad and the LCD display. A CF card is used to store the project files. User can operate multiple units to construct a concurrent multiprogramming system thank for the stand-alone mode. Only IC manufacturer approved programming algorithms are used for high reliability.Â±5% and Â±10% Vcc verification enhances programming reliability. Stand-alone Feature : Supported, Compact Flash Card .